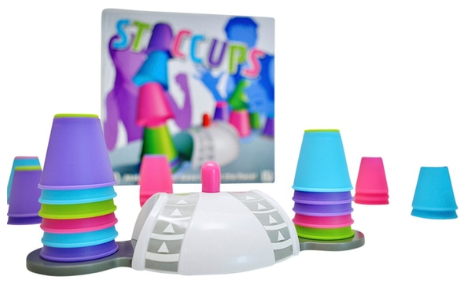 Today I've teamed up with University Games to give you the chance of winning the family favourite game, Staccups! 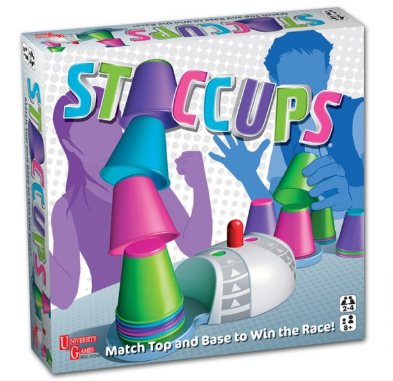 Speed and hand eye co-ordination are needed, in this fast, frantic stacking game. Race your opponent to clear all of your cups. If the base colour of your cup, matches the top colour of one on the podium, then stack it. Quickly! Aimed at 8+, this game is priced with an RRP of £19.99 and will definitely get those competitive juices flowing between the kids, and adults too. You can find out more about Staccups on the University Games website as well as being able to purchase this game from most toy stores and online. My youngest son - he sulks or stops playing if he loses or is losing! I am, I hate to loose but often do ! It’s either me for cheating, or my 7yo son for being a terrible loser! My son, he’s a sore loser! My son hates losing as well. My partner likes to win. I am, I'm a very sore loser .some games I just can't play, like monopoly, lol . My youngest she will cheat to win and if that fails will just stop the game . my eldest son, full on tantrums if he loses!! It's me. I hate losing. It is probably me, I hate it when I am losing! My youngest son, he’s a very sore loser! I think I'm pretty bad as I am very very competitive and hate when people don't take a game seriously. My Mum as she gets bored half way through a monopoly game and wanders off. My sister and me are equally as bad as each other. We both just hate losing! I think it might be me!! I'm a bit gloaty when I win and sometimes grumpy if I don't lol!! My nephew, he's terrible but he loves to play! My grandson, he has to win or we have screaming. Me, I'm usually quite rubbish at board games but hate losing! Me - I throw some nasty tantrums when things don't go my way. My husband! When he loose, he accuses me of cheating!!! I then deny cheating and he wont believe me!! My other half is a very bad loser! My granddaughter, if she is losing she tries to change the rules! my son is an appallingly bad loser! My six year old nephew. A complete meltdown when he loses. Me! It's always me who goes out first despite enjoying family board games. At present, it’s my 3 year old but I am trying hard to get him to accept that it is ok to lose. My youngest, although he's getting better the older he's getting! My great-nephew Maxx, if he's playing, say Snakes and Laddders, and keeps going down the snake, he either gives up and messes the board up so no-one know where they were. Has to be my wife she doesn’t even like losing to our daughter. My husband! He hates it when he loses! My hubby is a VERY bad loser! My youngest daughter, she always loses. Probably me, I'm way too competitive! My six year old he has a tantrum even when he's winning! My daughter as she isn't very good at losing. The worst board game player in our home has to be my husband! He is the world's worst loser! It's probably me!! If I'm losing too badly, I just make an excuse about household chores I must get done instantly so I can quit!!!! My youngest daughter she is blooming terrible at losing! Defo my partner, such a sore loser !